Jackson Waters gained an enthusiastic fan base that loved the band's energetic live shows and eclectic musical personality. "The best thing about our band and our sound is we all come from different backgrounds and musical influences," says drummer Ryan Hawk citing such diverse influences as Stevie Wonder, the Black Crowes, Keith Green, Steven Curtis Chapman, dcTalk and Boyz II Men. "It's like taking the best music over the last 50 years and trying to put it back together. I think we've done a decent job with that." To meld those diverse influences into a sound all their own, the band began working with Rob Hawkins, an up-and-coming producer who had worked with David Crowder on his Sunsets and Sushi album. 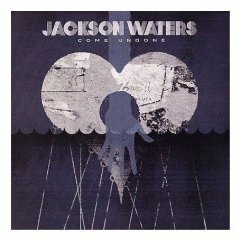 As a friend of Word Records A&R guru Otto Price, Hawkins began sharing the Jackson Waters project. Price’s enthusiasm for the band’s fresh sound soon led to a deal with Word Records. Another particular track, “Jamie’s Song,” is a relevant, hope-filled ballad that is sure to connect with listeners. Lead singer David says that “Come Undone” is his favorite, though. “The song is just about the skeletons in our closets. We all have a past and things we’ve done wrong, but we have a Father that loves us despite our imperfections. I think that’s the beauty of Christianity.” Each listen through takes the audience deeper into the lyrics and message, but essentially, only one listen through is necessary for Come Undone to become a CD collection staple. "We always were Christian guys in a band and every song we wrote about was about us or life, what we were going through, what our friends were going through and that still is the case," says lead singer David Leonard, who sees the band's audience as diverse. "It's a wide range. We've played to 15 year olds that love it and then their parents would come and they love it. We do have a lot of Southern rock influence and a lot of parents really love that because they grew up on that. We're hoping that everybody really catches it."